Published: Nov. 22, 2012 at 12:51 a.m. Updated: Nov. 22, 2012 at 11:28 a.m.
Fortune favors the bold. You don't win a Super Bowl by copying league trends or punting on fourth-and-1. You don't keep a wildly talented quarterback on the bench after one of the best performances of the season because you're afraid of the criticism that might follow. Instant Debate: Kaepernick or Smith? San Francisco 49ers coach Jim Harbaugh reportedly chose Colin Kaepernick to start Sunday's game against the New Orleans Saints, and he did it because he already knows what he has in Alex Smith. He wants to find out what he has in Kaepernick. The unknown is too tantalizing to ignore, even if rolling with a second-year pro at quarterback has its risks. Harbaugh knows Smith isn't hard to prepare for. Smith doesn't have a huge arm. We know his ceiling. 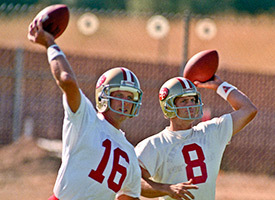 Is a QB controversy brewing in San Francisco? Take a look at our Top 10. Kaepernick is a wildly athletic quarterback with clearly improving accuracy. We can't just ignore how well he played Monday night. It was only one start, but it was a one hell of a start. It was the type of start Smith might not be capable of. We don't fault Harbaugh for wanting to see more. The 49ers' coaching staff has proven to be excellent at creatively maximizing their players' strengths. Their entire schematic and organizational approach to the NFL is unique. They coached around Smith last season. They built him up. Their focus then was on defense and the running game, but they want to evolve. Smith was making strides, but the 49ers traded up in the second round for Kaepernick because his ceiling is higher. Kaepernick allows 49ers coaches to unlock even more of their creativity. That support, the running game and the defense all provide an atmosphere conducive to success for a young quarterback (not to mention this week's opponent, the Saints). Playing Smith this week would be playing it safe. The 49ers have no use for that.